Quimbaya is a small, unassuming town in the North Andes that derives its name from the Quimbaya civilisation that inhabited the area before the Spanish conquest: an advanced pre-Colombian civilisation of excellent goldsmiths famous for their unbelievable technical skill. A decidedly modern town with few examples of colonial architecture, it still retains its traditions with great pride, but the real beauty of Quimbaya lies in the array of activities you can do from bamboo rafting to the Festival of Lights and the artisan workshops. The best places to stay in Quimbaya will make you want to come again and again. The main square of the town is full of cafes, drinking holes and juice bars. There is an Artisans Mall in the main square, dedicated to the making of custom-made shoes, sandals and general leather work. While outside street vendors abound selling arepas, plantains, fruits and empanadas. Being in the beating-heart of coffee-country, many of the coffee shops sell their own roasts. The church lying in the centre stands as a nice symbol of the town: modern but beautiful, with gorgeous stained glass windows and an exterior that seems to blend indigenous design with Catholic aesthetic. The nearby countryside is full of rare species of bird and plant, as well as being a great place for hiking. The river allows you to explore the landscape via bamboo rafts and you can go on boat tours with several companies in the town who will take you to swim beneath hidden waterfalls. If you're lucky enough to be in town in December, you can see the Dia de las Velitas: all the roads are closed while the streets are full of paper lanterns baring images of farmyard animals, the Virgin Mary, the Nazarene and flowers. Take a boat tour of the river and find picturesque waterfalls. Swim in the river with the guides or beneath the secluded waterfall they take you to. On 7th December the town hosts the Dia de las Velitas (The Festival of Lights). All roads are closed and commerce sleeps, while the streets are full of beautiful lanterns that radiate with light. About 20 minutes outside of town is Panaca, a petting zoo that also has a zip-line. Kids love it and it is a great day out, particularly if it's your birthday as they let you in for free. They also have a forest that is full of a huge variety of colourful exotic birds. Quimbaya is a sleepy town with a lot to offer in the way of outdoor activities so the best places to stay in Quimbaya tend to have easy access to the surrounding countryside. Hacienda Buenavista is an adults only luxury retreat which sits in a rural setting and offers fantastic views and five star comfort. Plus fabulous food with a daily changing menu. A great place to explore from. Our partner Booking.com has a wide range of villas, cottages and apartments. With fairly stable temperatures year-round, the best times to go are when it rains the least: January, Febuary, July and August. Fly to Matecana International Airport in Pereira, which is just 37km away. Browse through all our options on the best places to stay in Colombia. 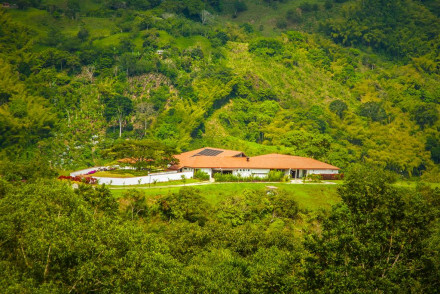 The 5* Hacienda Buena Vista enjoys a rural setting in Quimbaya and offers breathtaking views of the surrounding area. Enjoy privacy and space when you stay in one of their five individual suites and curl up in the library with a good book after a day out exploring. A first-rate countryside escape! Great walks - Stroll through the luscious gardens or pop down to their beautiful 10 metre waterfall just a short walk away!